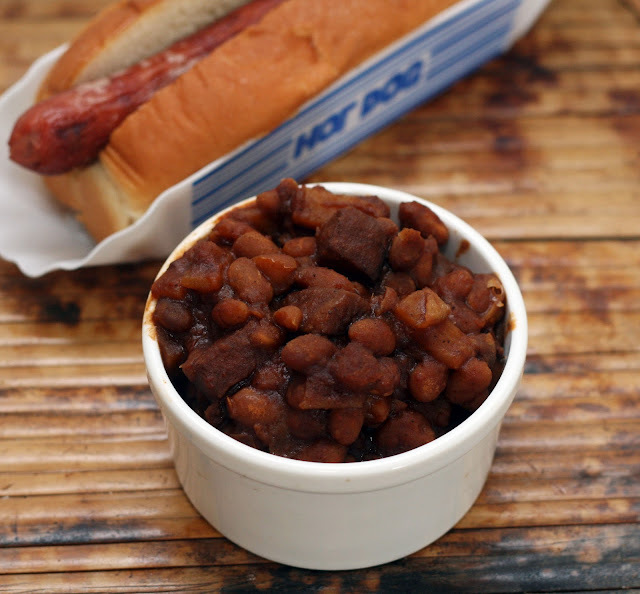 What goes better with grilled foods than baked beans? The slow cooker is my favorite way to make them because there is no need to pre-cook the beans and they come out perfectly every time. I always put fruit and fruit juice in my beans because it adds moisture and natural sweetness without adding sugar or water. Why spam? Why not? It adds a great salty-hammy-savory note and holds its shape well. If you are spam-phobic, don't be, especially when browned, it is strangely addictive. No one I've served it to has ever complained! In a small bowl, whisk together the dressing ingredients until smooth. 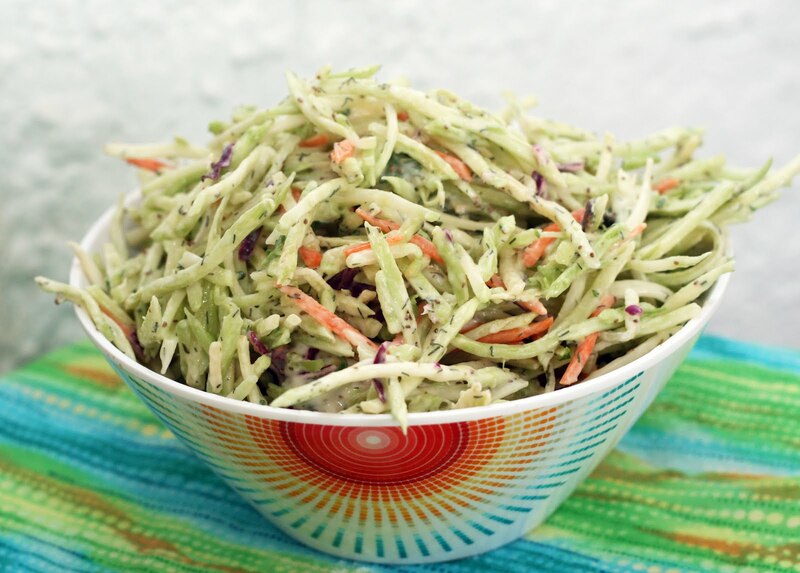 Toss with shredded vegetables until evenly distributed. Refrigerate 1 hour prior to serving. I love broccoli slaw. It is a fun alternative to regular slaw and is so crisp! I admit, part of the draw is that it is one of the few pre-cut salad things I buy (and like, I don't like regular cabbage bagged coleslaw mix) so I mainly make it when we have company and I want a quick side dish or if I am making something time consuming/spending the day testing recipes and still have to make dinner. But honestly, it is tasty and crisp and takes well to pretty much any dressing. I whipped up this one using ingredients from my spice cabinet. I liked using the ground lemon peel because unlike fresh lemon juice, it didn't become too tart or acidic from the lemon juice + vinegar combo but that lemon flavor was still there. I liked using the ground mustard too because unlike regular mustard, it didn't add to the volume of dressing. I really wanted a light, thin dressing and this worked perfectly. Line two baking sheets with parchment paper. Preheat the oven to 250. Toss all ingredients together. Make sure the nuts are evenly coated. Arrange in a single layer on one of the baking sheets and bake 25-35 minutes, or until the peanuts look mostly dry, stirring every 5 minutes. Remove from the oven and allow to cool on the remaining lined baking sheet. Tip: Set the oven timer for 5 minutes, stir the nuts. Carefully reach in the oven and tossed them with a spatula then set the timer again until 30 or so minutes were up. I've been on a real Old Bay kick lately. As you might have noticed from recent recipes. I blame Baltimore. Anyway, it has been ages since I made spiced nuts and when I was trying to think of what flavors to use, I thought. Why not Old Bay? Why not, indeed. I added some extra spices to kick up the heat factor and make them even more addictive.These would be perfect as a snack at your next casual summer party. In a dry pan, heat the salt and pepper mixture, stirring continuously to avoid burning, for 3-5 minutes or until heated through and very fragrant. Pour into a plate to cool completely. Set aside. Meanwhile, add 1 tablespoon of the kosher salt to a small bowl of cold water. Stir to dissolve. Add the shrimp and wash the shrimp. Drain then repeat with remaining salt. Rinse the shrimp in cold water then pat dry. Set aside. Stir together the cornstarch, flour and 1-2 tablespoon(s) of the salt and pepper mix in a shallow bowl. Dredge the shrimp. Heat about 1 inch of canola oil in a large wok or skillet. Add the shrimp and fry, 2-3 minutes or until fully cooked. Drain on a paper towel lined plate. Plate and garnish with the minced chile. Sprinkle with additional salt mixture, if desired. If there is one thing that is popular in Hong Kong is food. 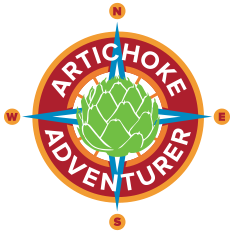 You can find dishes from nearly very providence in China as well as Japanese, British, Indian and American-influenced dishes. 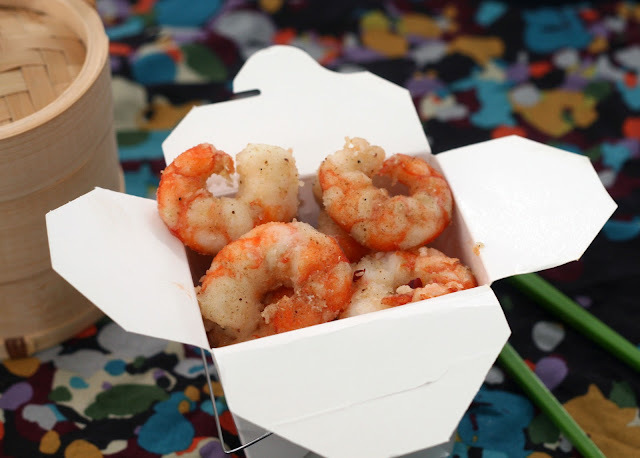 Since Bravo's “Around the World in 80 Plates will be in Hong Kong this week (June 27th, 10/9c)I thought it would be a fun chance to make one of my favorite Cantonese dishes, which is easy to find in Hong Kong, lightly coated, crisp salt and pepper shrimp. It is traditionally found at dinnertime (steamed dishes like dumplings are the ones found earlier in the day, during yum cha) at one of the many dim sum restaurants. I modified the dish a bit from being absolutely traditional to make it more "user friendly"; I peeled the shrimp instead of leaving the shells on and used cornstarch instead of harder-to-find rice flour but the end result is wonderful. 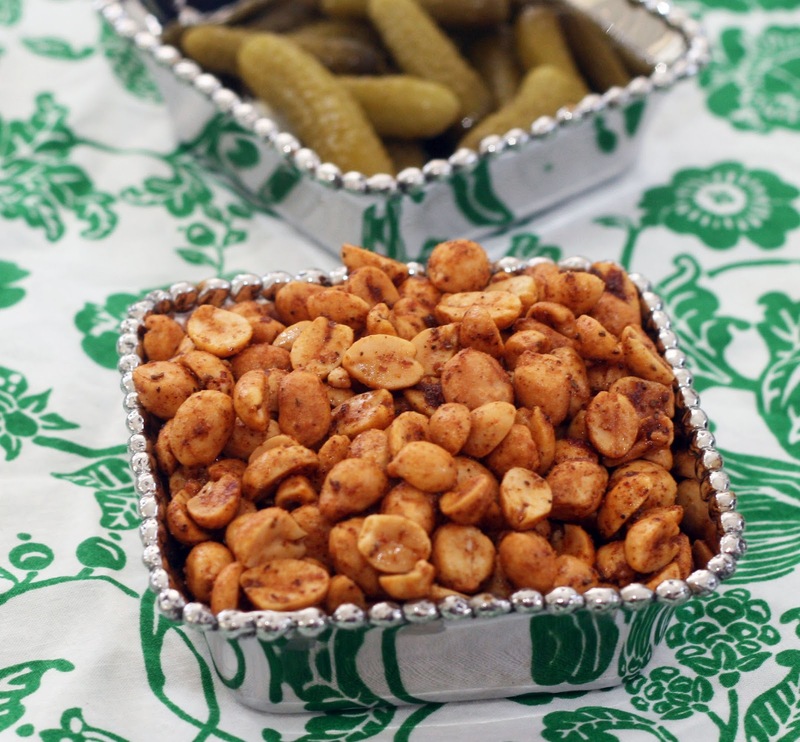 Spicy and salty and crunchy. They are super fun to make in a wok but if your wok frying skills aren't the best, you can fry the whole batch at once in a large heavy bottomed skillet. Sichuan peppercorns are know for their "numbing hot" tendencies, they make your tongue and lips tingle a bit while providing their signature citrus-y flavor. Store the leftover salt/pepper mixture in an airtight container for the next time you make salt and pepper shrimp (or try it on popcorn!). Toss the corn, onion, cornichons and potato together in a medium bowl. In a small bowl, whisk together the mayo and Old Bay. Drizzle over the potato mixture. Stir to evenly coat. Serve at room temperature. 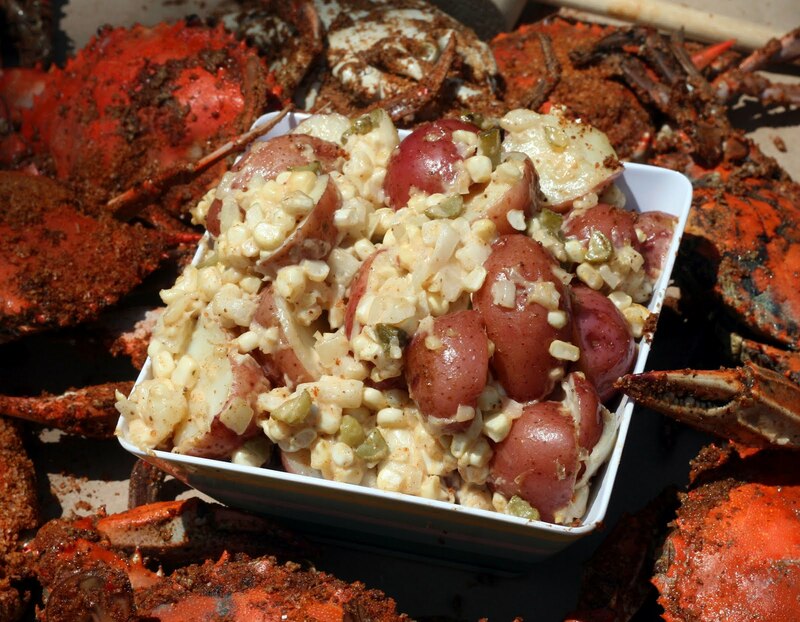 Old Bay, potato salad and fresh corn. The hallmarks of a Baltimore summer along with steamed crabs and humidity. I guess I could have put crab in it really drive the point home but like most natives, I don't like to take away from the taste of the crab or use a lot of filler. Instead, I served this with steamed crabs. Normally I don't serve anything with steamed crabs but I had a special request. 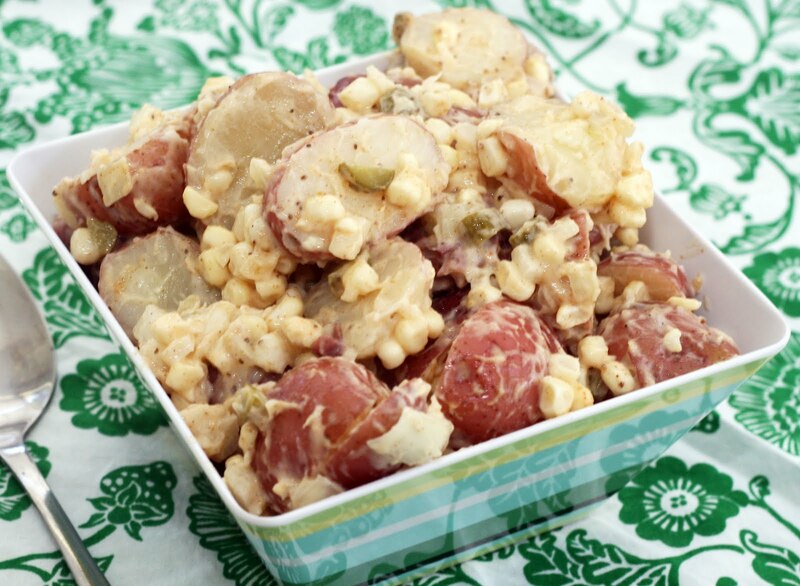 I liked how the potato salad came out, good crunch and sweetness from the corn and just a hint of pickle. Place the berries, cream cheese and sweetened condensed milk in a blender or food processor (I used my Vita-Mix) and pulse until smooth. Pour into the crust. Refrigerate until set, at least 2 hours. 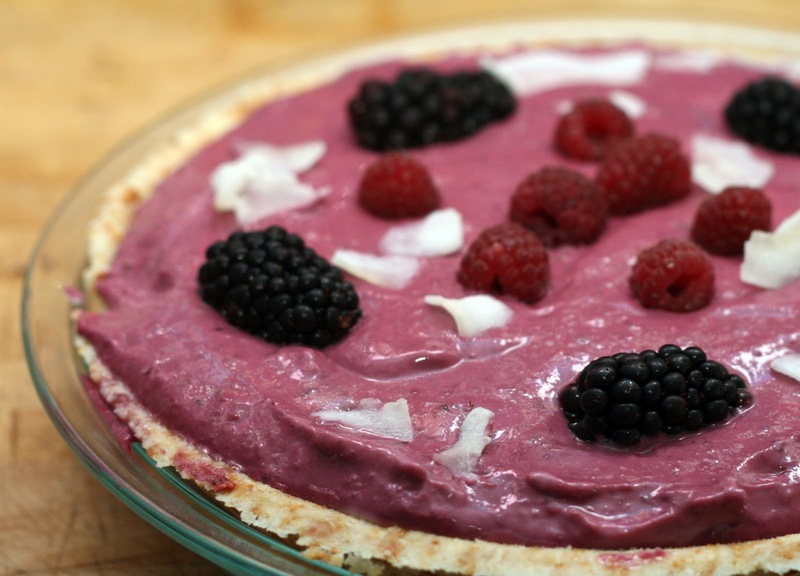 Garnish with fresh blackberries, raspberries and coconut flakes. 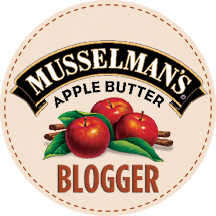 Note: I like/don't mind the blackberry seeds but I know from writing this blog, a lot of people do. I think (but haven't tried) that it would work just as well if you blended the blackberries first, strained out the seeds then continued on with the rest of the above directions. Some times I feel like I am work the front lines of the fight to preserve the ice box pie. Nine times out of ten when I mention one, people's first reaction is "huh?". Which is a shame because ice box pies are awesome. They got their name and rose in popularity back when actual ice boxes were a reality. Especially popular in hotter climates, they were the perfect pie for summer: no real baking required which means no heating up the house. Some pies require a stint in the freezer but I prefer the more traditional set-up in the fridge kind. Their texture is softer and I think the flavors more pronounced. This pie, by the way was made using the berries from our first big harvest of the year! So excited to see raspberries, blackberries and even a few blueberries out there.We've had blackberry success in the past but this is the first year we've had raspberries and blueberries. Is is horrible that every time I look at this (cellphone) picture I think how much the berries would have cost in the supermarket? I swear that is the whole reason we garden: so I can have fruit to experiment with and not feel guilty. 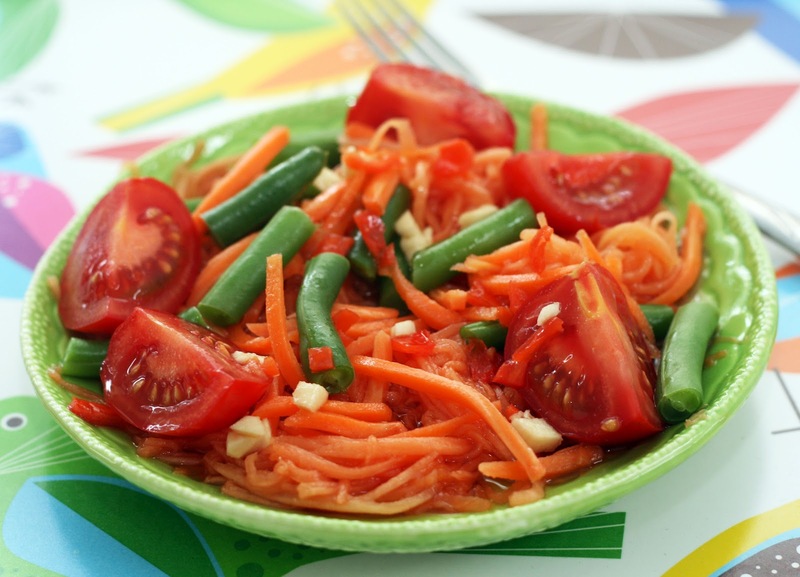 In a large bowl, toss together the papaya, carrots, tomatoes and long beans. Use a potato masher to In a small bowl, whisk together the chiles, garlic, fish sauce, lime juice and palm sugar, taking care to fully dissolve the palm sugar. Drizzle over the papaya salad and toss to coat. Serve immediately. Bravo's “Around the World in 80 Plates”was taking place in Chiang Mai, Thailand this week (June 20th, 10/9c) I thought I'd make a version of one of the wonderful salads Thailand is famous for. This is a simplified take on som tam, the Northern Thai papaya salad. Traditionally the ingredient are lightly mashed with a mortar and pestle but most people do not have a big enough mortar to make the salad in. So instead, I minced the peppers and garlic rather than bashing them and instead lightly mashed the fruit and vegetables with a potato masher in a bowl to achieve a similar effect. But, rest assure the same distinctive sweet-salty-unami flavor is there. You can mix it up by varying the ingredients a bit: try raw Thai eggplant or cucumber or green mango for a more Laotian twist. Whisk together all of the spices in a small bowl. Thoroughly rub the spices on all sides of the meat. Store leftover spice rub in an airtight container. Place on one rack of your smoker. Place one chimney worth of unlit coals in the coal ring. Add two chunks of mesquite then add one chimney worth of lit coals on top. Place two chunks of apple wood on top of the lit coals. Reassemble the smoker. Fill the water bowl with cold water. Smoke for 3 1/2 hours keeping the temperature between 225-275. Optional: brown on the grill or under a broiler briefly. Allow to sit 5 minutes prior to slicing. Oh my, this was a wonderful dinner. I have never had a tastier, juiciest pork loin in my life. I've had good pork loin but none like this. 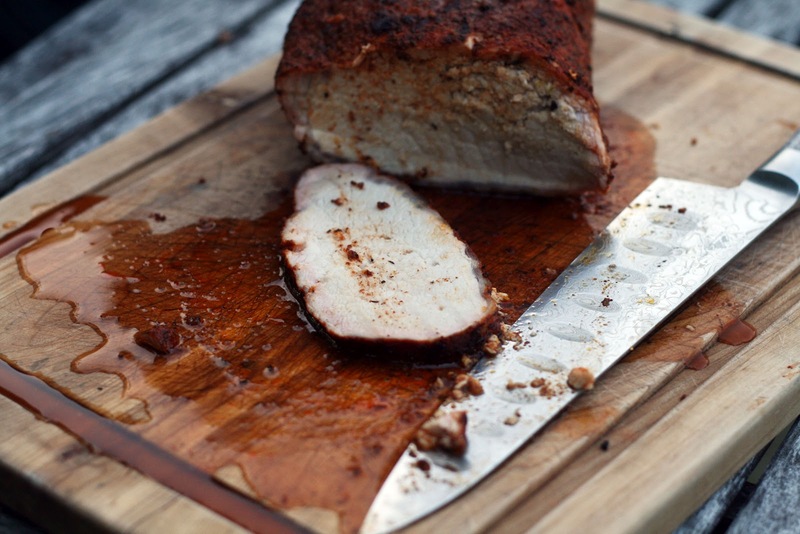 Pork loin is a tricky thing, you need it to be thoroughly cooked because, well, it is pork but since it is so lean, it goes from tasty to dried out piece of wood quickly. It had a lovely light smoked flavor and the spices provided the perfect spicy note. My new favorite pork loin. Whisk together the dressing ingredients. Set aside. Divide the green between two bowls. Arrange the salad ingredients on top. Drizzle with dressing. Serve immediately. *I used the greens off of a standard bunch of about 4 beets. **I just squeezed them in my hand. The market had some lovely local beets and strawberries for sale. I had an idea to use up the actual beets but the attached greens were so lovely, I didn't want them to go to waste. I didn't have anything planned for lunch today so I came up with this simple yet robust tasting salad. I love how the slightly bitter greens contrast with the sweet, ripe berries. Don't be tempted to skip the blanching step, the greens are much more tender afterwards. Preheat oven to 350. Line a cookie sheet with parchment paper. Cream together the butter and sugar. Add the egg, flour and zest. Mix until a thick dough forms. Refrigerate until firm, if needed. Roll out onto a floured surface to about 1/4 inch thick. Use a 3 inch biscuit cutter to make rounds. 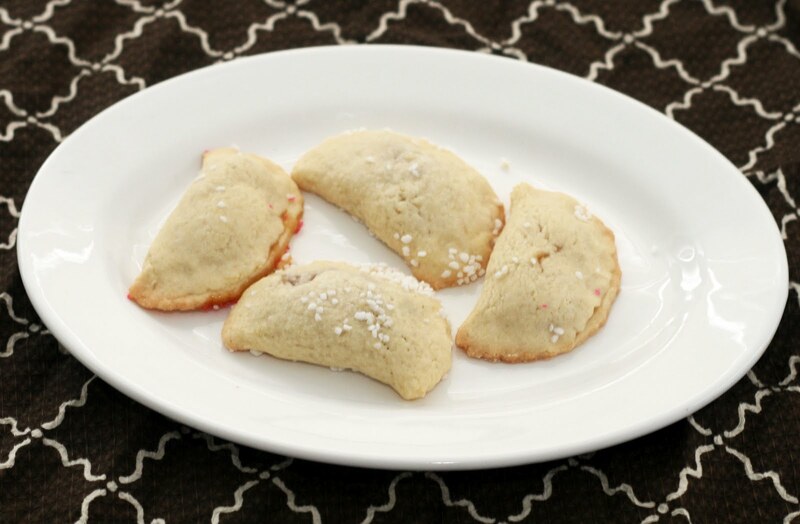 Center 1 tablespoons jam into each cookie. Fold in half and pinch shut. Sprinkle with pearl sugar. Bake for 12-15 minutes or until golden brown. Remove a wire rack to cool. It is time for an other installment of Bravo's “Around the World in 80 Plates”! 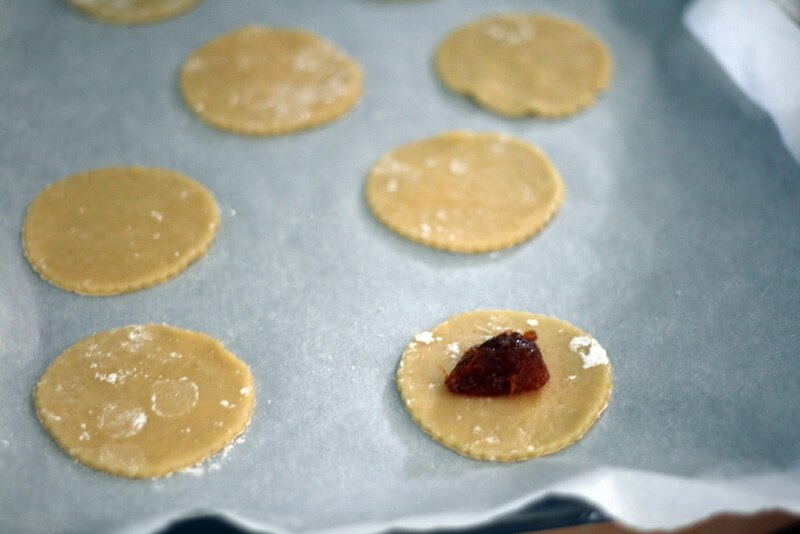 This week they will be in Bologna, Italy (June 13th 10/9c) so Matt made these traditional Bolognese cookies. Apparently they are traditionally made with mustard (?!) and plum jam but we used some homemade raspberry jam instead. Simple but very tasty! Sort of like an Italian version of a thumbprint cookie. Preheat oven to 350. In a large bowl, mix together the beef, egg, bread crumbs, onion, garlic and 3 tablespoons of the beet ketchup. Form into a loaf. Place in a loaf pan (or, preferably, a meatloaf pan). Brush the top with the remaining beet ketchup. Bake for 50 minutes or until fully cooked. Wait a few minutes before slicing. *I just pulsed a couple of wedges of leftover schiacciata all'olio in the Vita Mix until it formed crumbs. **Since I used my Vita Mix for the bread crumbs, I went ahead and used it to chop up the onions and garlic to a grated texture. I admit, this isn't the most glamorous recipe. Even on a good day, meatloaf isn't terribly thrilling or attractive. Beet ketchup sounds a bit odd to begin with and well, I couldn't resist calling this beetloaf. However, I will assure you that this recipe, simple and homely as it is, is a winner. The meat was juicy and tender but not fatty and it the ketchup added the right note of sweet-savoriness. We couldn't wait for leftover meatloaf sandwiches. Toss all of the salad ingredients together in a large bowl. 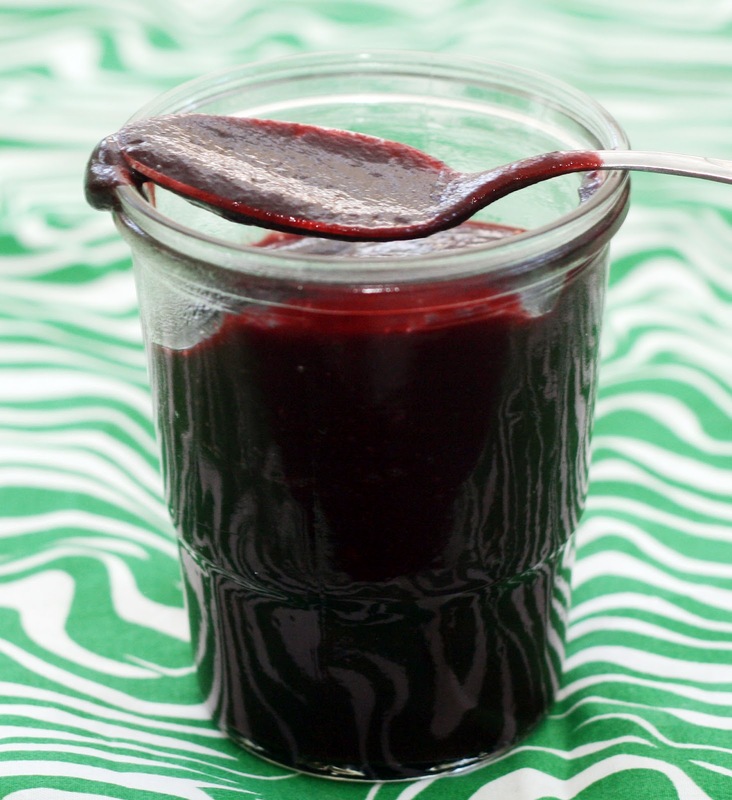 Shake the vinaigrette ingredients in a dressing mixing container or closed jar. Strain over the salad. Toss to evenly distribute the dressing. Serve at room temperature. When I was in Nashville, I had the best corn; I really wanted to bring a few ears home with me in my carry-on. Reluctantly I didn't so I was happy to find some lovely looking corn at the market we go to. I think it is from a bit further south, June is early for corn in Baltimore, but it is still really good. I also found June peas which are a bit of a rarity, especially for those of us who do not get up very early on Sundays and therefore miss the good stuff at the farmers market. Luckily, this market carries tons of their farm's produce and is open 7 days a week. Anyway! 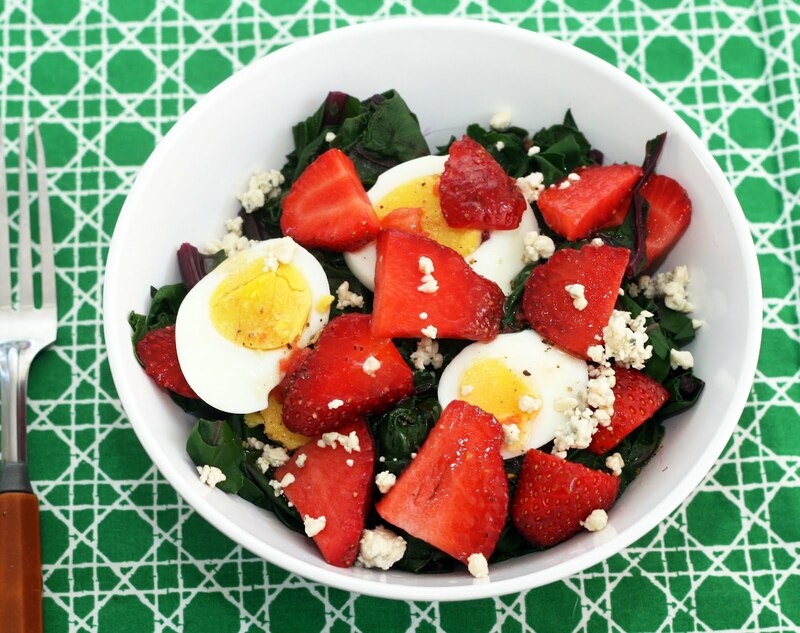 This salad is light, fresh and crisp. I love leaving the corn and peas raw because they are so sweet and tender this time of the year. The dressing adds some zip. 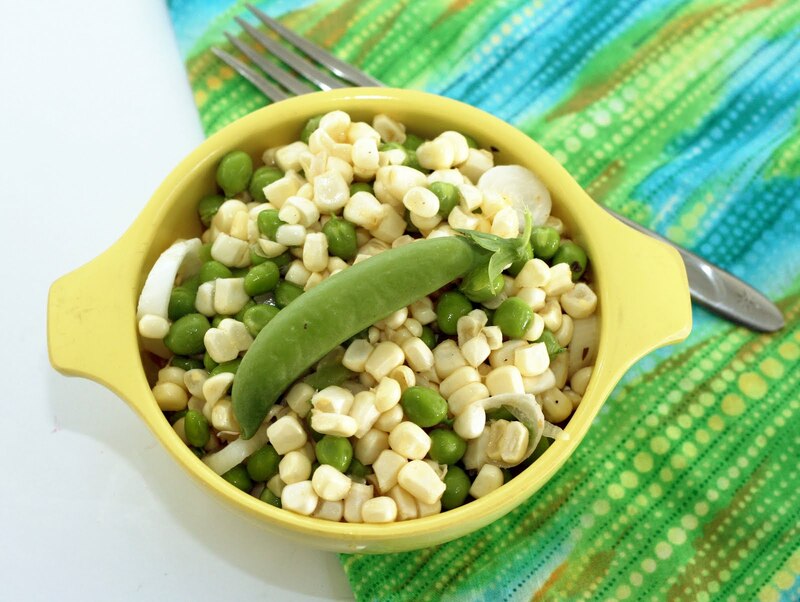 The perfect no fuss side dish for summer. Place all ingredients in a medium saucepan. Bring to a boil then reduce heat. Simmer 40-50 minutes or until about 1/2 of the liquid has evaporated. Pour into a blender* and pulse until smooth. 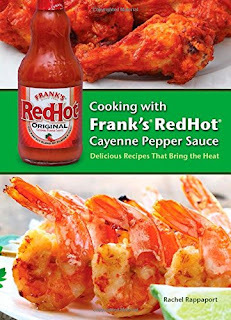 Cool and refrigerate prior using. Store leftovers, refrigerated, in an air-tight container 2-4 weeks. *You could use an immersion blender but the mixture splatters and beets stain. As readers know, I do not like ketchup. That is to say I do not like tomato ketchup. After having mango ketchup years ago at a mango festival in Miami, I have come realize other flavored, more "artisan" ketchups are just fine. It has been two years since I made my version of the mango ketchup I had that day and I thought it was time to take more. I'm really pleased with how it came out. Not as cloyingly sweet as commercial ketchup but not sour or pickle-y either. For the beet adverse, it really is ketchup, not just a sauce. It doesn't scream beet, it is just subtly sweet and fruity. 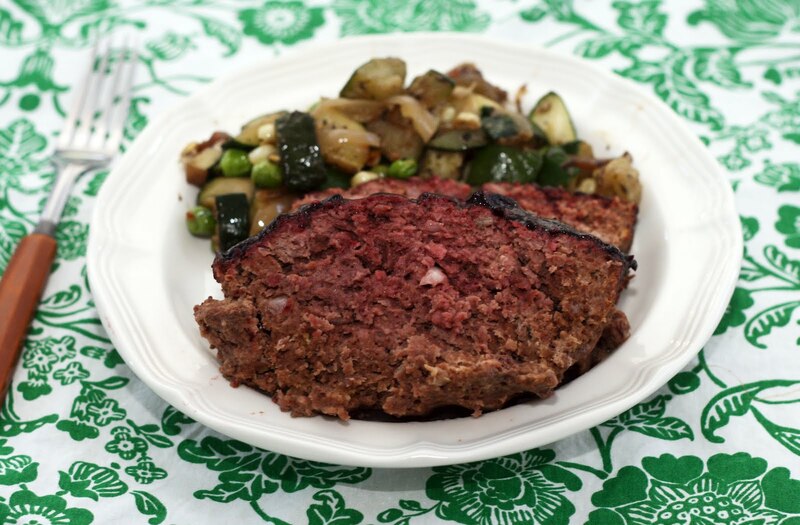 Try it as a topping or swirled into meatloaf. I loved it on my "Scandinavian" burgers. In the bowl of a stand mixer, mix together the yeast and water. Stir to dissolve. Add the flour, salt and olive oil. Using the dough hook attachment, mix until it forms a smooth ball. Place in a oiled bowl. Cover with a tea towel and allow to rise about 1 hour or until it doubles in bulk. Oil a standard jelly roll pan and spread the dough out on the pan, reaching all four sides and corners. Allow to rise 30 minutes. Lightly dimple the top of the dough using your fingertips. Brush with olive oil and sprinkle with the additional salt. Preheat oven to 400. Bake 20 minutes or until golden brown. Allow to cool, then slice. I haven't made bread in while so when I was looking for inspiration for a new recipe to go with this week's Bravo's “Around the World in 80 Plates” which is going to be in Florence, Italy (June 6th 10/9c), I was to excited to see this bread on the menu of nearly every restaurant and bakery menu I came across. The dough is a snap to put together, very elastic to work with and for a homemade yeast bread, does not need a ton of rising time. 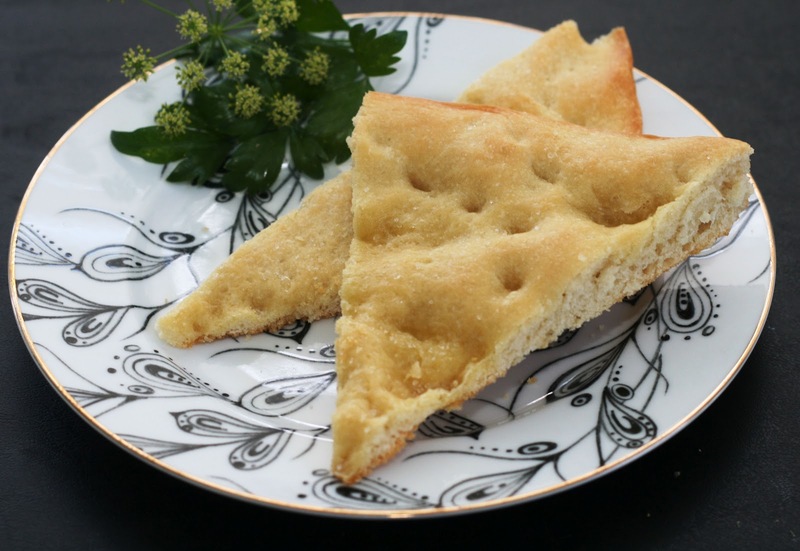 It is truly a simple, delicious, classic Italian bread. The finished product is very satisfying as a snack, for breakfast or along side a salad for dinner. Take care to use good quality, tasty olive oil for this bread though, it is what really gives it its flavor. Leftovers make wonderful bread for panini. Fun fact: Focacceria Pugi opened in 1924 selling this bread and to this day "Pugi" is used as a synonym with schiacciata all'olio. So if you are in Italy and someone wants some Pugi, you know what they mean! Prep grill to manufacturers' instructions. Spray the rack with nonstick grill spray. In a medium bowl, gentle mix together all ingredients. Form into 8 equal patties. Grill, turning once, until fully cooked. Serve immediately. Okay, there is nothing Scandinavian about these burgers. I had an idea for a spiced burger and by the time I finished, I realized I had used all of the ingredients that are present in my favorite Swedish dishes. 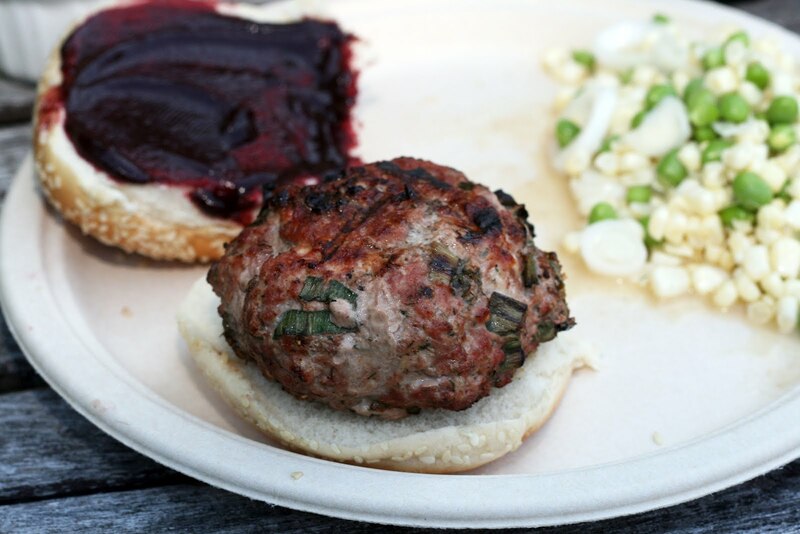 Although turkey burgers have no Swedish origins, the flavors went well with the juicy meat. Turkey thighs have a more pronounced flavor than chicken so it can take strong flavors without being overpowered. Here the lemon and spring onion cut any hint of gameness and the spices add a very unusual yet very tasty flavor. Turkey thighs have a slightly higher fat content than turkey breast which is great for grilling. It means a juicer, tastier burger that won't stick to your grill.